Win The Expendables 3: Big action and bigger stars | SWITCH. Barney (Sylvester Stallone: Academy Award nominated for 'Rocky'), Christmas (Jason Statham: 'The Bank Job', 'Revolver') and the rest of the team comes face-to-face with Conrad Stonebanks (Mel Gibson: Academy Award winner for 'Braveheart'), who years ago co-founded The Expendables with Barney. Stonebanks subsequently became a ruthless arms trader and someone who Barney was forced to kill... or so he thought. Stonebanks, who eluded death once before, now is making it his mission to end the Expendables - but Barney has other plans. Barney decides that he has to fight old blood with new blood, and brings in a new era of Expendables team members, recruiting individuals who are younger, faster and more tech- savvy. The latest mission becomes a clash of classic old-school style versus high-tech expertise in this action-packed film! The full star cast including Antonio Banderas, Jet Li, Wesley Snipes, Dolph Lundgren, Kelsey Grammer, Randy Couture, Terry Crews, Harrison Ford and Arnold Schwarzenegger will have you hanging off the edge of your seat in the Expendables’ most personal battle yet. The 'The Expendables 3' competition has now closed. Winners will be announced shortly. Competition opens at 5pm AEDT on Sunday 7th December 2014 and closes at 11:59pm AEDT on Sunday 14th December 2014. Five winners will be chosen at random on Monday 15th December 2014. To successfully win, entrants must fulfil the above entry conditions before the time the competition closes. Current members/followers are eligible to enter the competition. Only one entry per person. Only one winner per household. To be a valid winner, the entrant must not have won a prize from SWITCH within the last 28 days. Each winner will receive one Blu-ray copy of 'The Expendables 3'. By entering, you agree to receive occasional emails from SWITCH in the future. If you decide to unsubscribe from these updates, any further entries will not be applicable. Only Australian residents are eligible to enter. 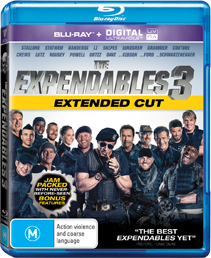 'The Expendables 3' is available on Digital, Ultraviolet Blu-ray and Ultraviolet DVD on Thursday the 11th December 2014 from Roadshow.